Newport Bay Sediment Analysis | Sea Engineering, Inc.
Sea Engineering, Inc. (SEI) conducted a Sedflume analysis for the City of Newport Beach, CA on four cores obtained from the Upper Newport Bay. The goal of this work was to characterize and quantify the stability of the sediments at the sites. Cores were collected in water depths between 1.37 and 4.85 meters. The cores showed the wide variation in the sediments present in the Bay. 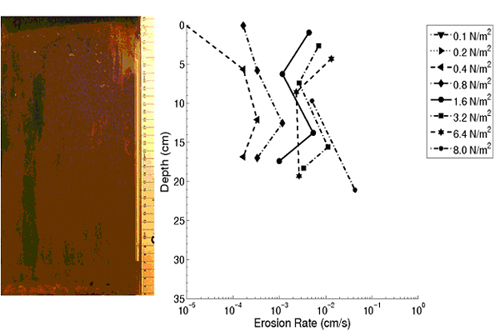 Depositional areas showed typical consolidation profiles with increasing strength with depth, while other areas showed distinct sediment layer typical of periodic sediment transport caused by large storm events in the system. The data from the cores provide a direct quantitative measurement of erosion rate and critical shear stress of the Newport Bay sediments with depth. This data will in turn be used by researchers at UCI to develop a quantitative model of sediment transport in the system to gain a more quantitative insight into sediments and subsequent contaminant movement in the Bay.